At JP Precision Machine, Precision is our middle name. We strive for 100% quality everyday. Parts to print, always. Customer satisfaction is a must to our dedicated precision machinists. We do it all. From machining exotic metals to everyday materials such as brass, aluminum, steel and plastics. 316 Stainless is our specialty! Let us solve your part problems for you. Short runs to all out production, we can get the job done. 100 to 5,000+ Piece Orders Standard - 1 to 10 Piece Orders Accepted Also! We take pride in all our machining. Located in Waltham, Massachusetts we have been in business since 1992. At the present, we have (10) CNC Vertical Milling Machines and CNC Turning Centers. Full compliment of shop support equipment. Top of the line metrology / inspection gear. Plus an in-house Grinding Shop capable of grinding Carbides, Ceramics and Special Tooling. Aerospace, Naval, Defense, Medical, Paper, Machine Tool, OEM's etc. If you are looking for a Precision Job Shop that delivers quality in every part, Look no further. 100% in process inspection is performed on every part. Our "NBQ" system ensures your parts are to print everytime! Six Sided Milling On this Pump Housing Made From Black Delrin. Super Precision And Quality From Our Mori Seiki Vertical Machining Centers! 316 Stainless Steel is An Everyday Material For Us At JP Precision. Beautiful Surface Finishes And As Always All Dimensions To Drawing Specifications! Check Out More Of Our Work On Our Machined Parts Page. Click Here To Visit Our Machined Parts Page. 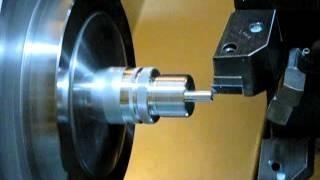 Click On The Picture To View One Of JP's CNC Turning Centers!